Shiplake Scout Group is part of Thames Chiltern Scout District. 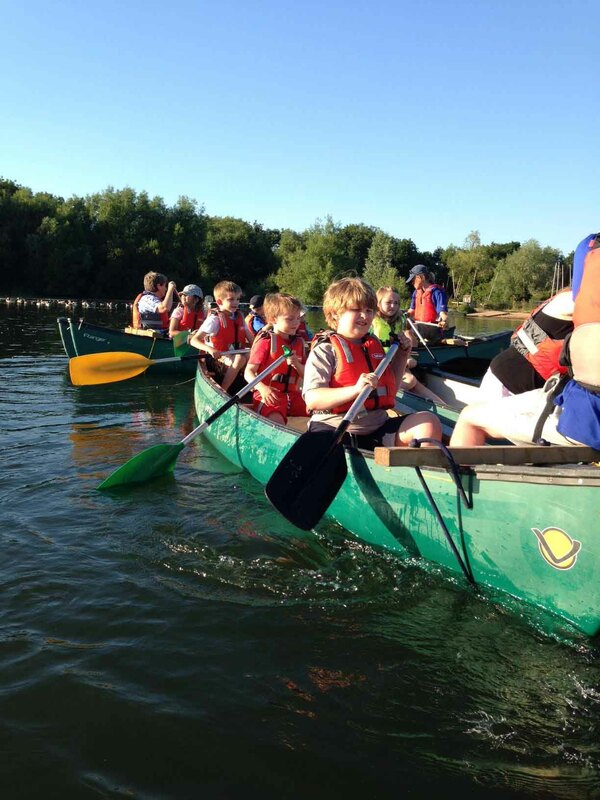 The group has Beaver, Cub and Scout sections catering for boys and girls between the ages of 6 - 14 years old. 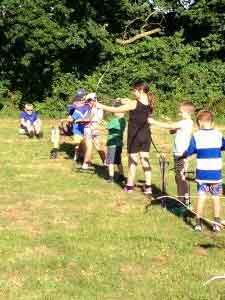 All sections have a very active programme ranging from playing games in our scout hut in the winter to camping in tents during the summer. 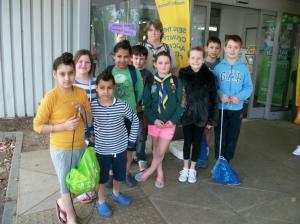 1st Shiplake Scout hut is located opposite Orwells pub. 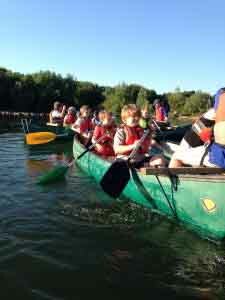 1st Shiplake Beavers & Cubs went to Dinton Pastures Monday 25th June. They were there three hours doing Archery & Kata canoeing and then they were offered the chance to jump off the jetty if they were brave enough...... into the lake. Great fun was had by all. A burst water main on the A4155 junction with Memorial Ave: & Mill road resulted in Shiplake Cross having no water for several hours for a couple of days at the beginning of June. 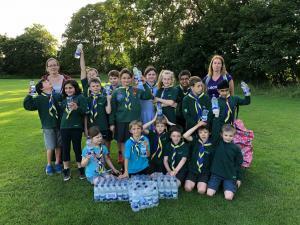 Some drinking water was made available and was distributed with the help of the Beavers, Cubs and Scouts. 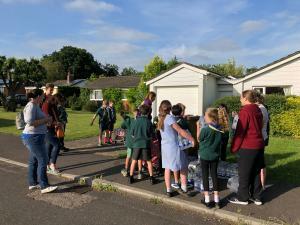 The community helps the Scouts; the Scouts help the community. 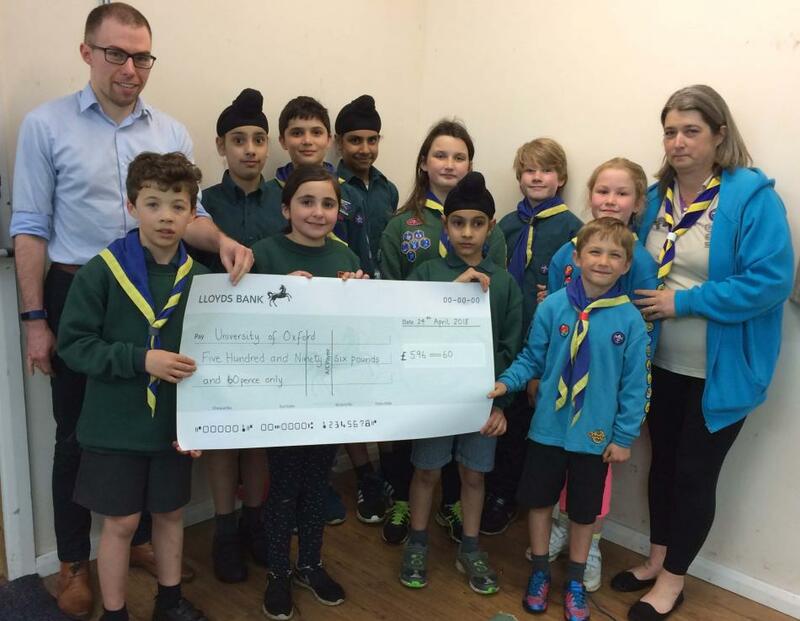 Kaeti Martin, Beavers, Cubs & Scouts presenting Eoin Mac Réamoinn from the Gene Medicine Research Group in Oxford a cheque for £596:60 to help fund their research. 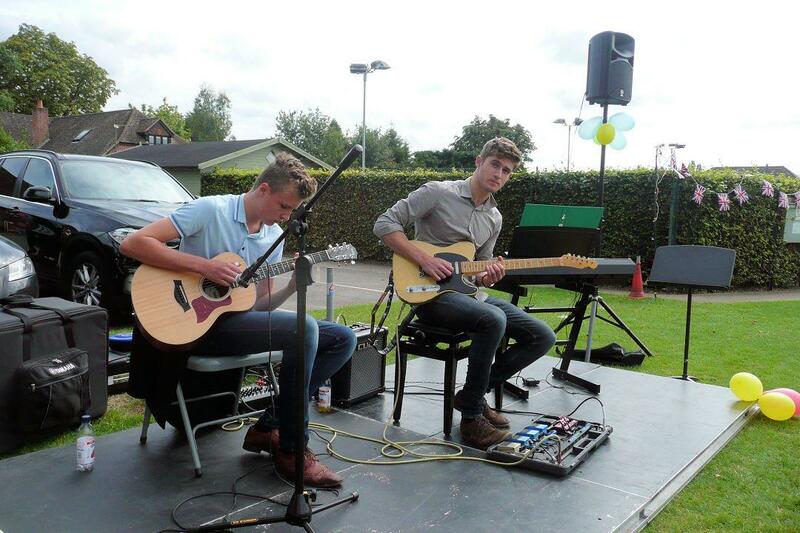 In actual fact the total amount raised was £616:80. Please, please come and support 1st Shiplake Scouts at a very special event this Tuesday night (24th April). Have you heard of "Cystic Fibrosis"? Well we will be having a presentation about this condition at 1st Shiplake Scout Groups HQ on Tuesday 24th April 2018 @ 7:00 p.m. The presentation will be given by a member of the "Gene Medicine Research Group" from the John Radcliffe Hospital. Everyone is very welcome to attend and Orwells have kindly made their car park available to us. 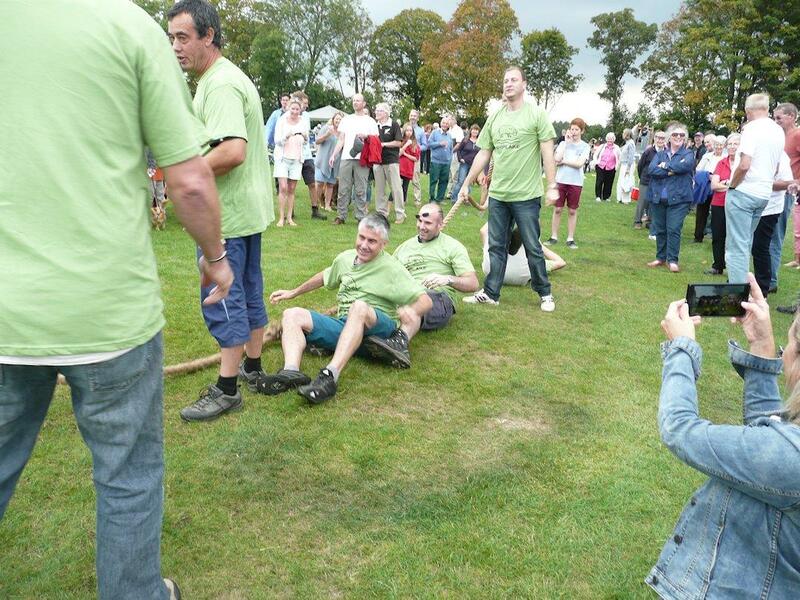 On May 13th the 1st Shiplake Scout Group once again hosted a homemade go-cart (soap box cart) event at the Scout Hut in the small wood at the back of the hut. 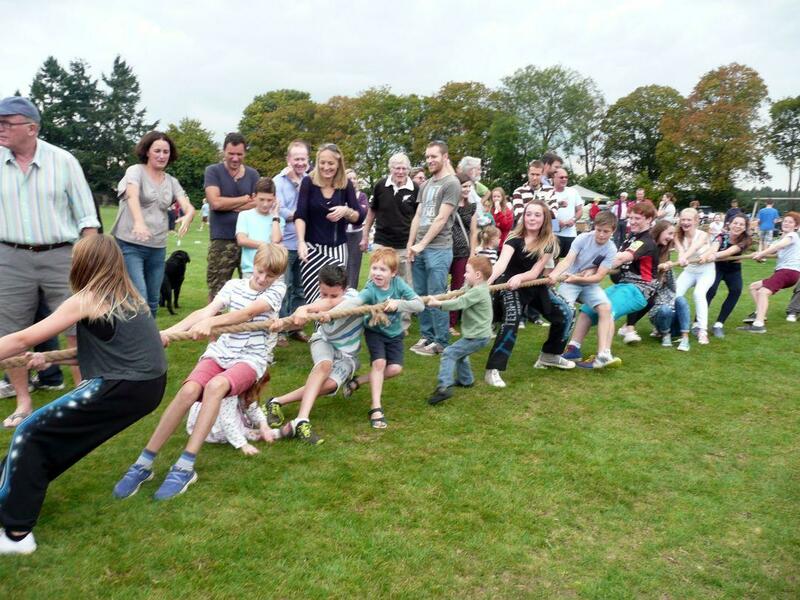 This competition has been going since 1970, and has mostly been held at Shiplake except when the Shiplake site was too wet and it was held it at Goring Heath`s HQ. Cubs from Stoke Row, Shiplake, Sonning Common, Goring Heath, Henley, Goring (2 packs) and Benson (first time) took part. one of the most popular in the District calendar. Any money awarded would go towards repairing the roof of the scout hut. 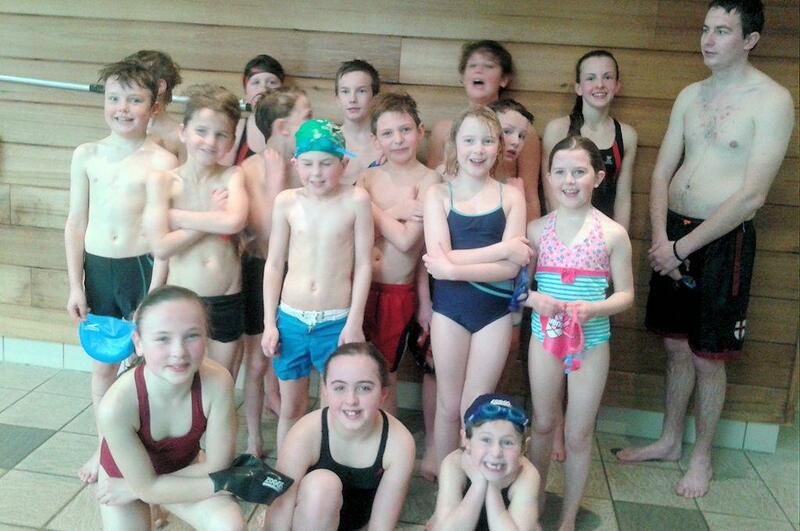 The Shiplake Dolphins & The Shiplake Sharks participated in the Lions Swimarathon on Saturday 25th March. Between the two teams they raised a massive £759 to be split between the Henley Lions and The Scout group roof fund. Very well done to all the swimers and a very big thank you for taking part. Thank you also to all the sponsors that backed them. 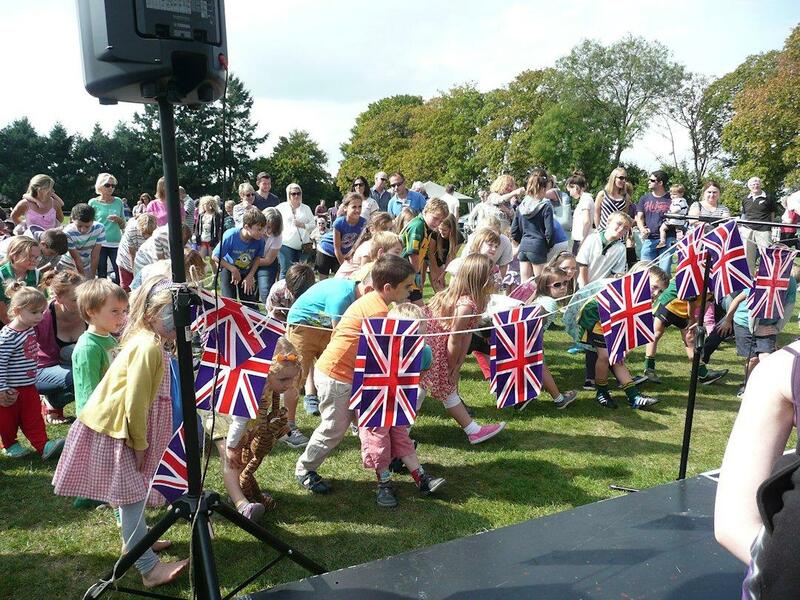 The 1st Shiplake Scout groups "Join the Generations Tea Party 2017" was a great sucess again this year with villagers both from Shiplake and Binfield Heath joining in. 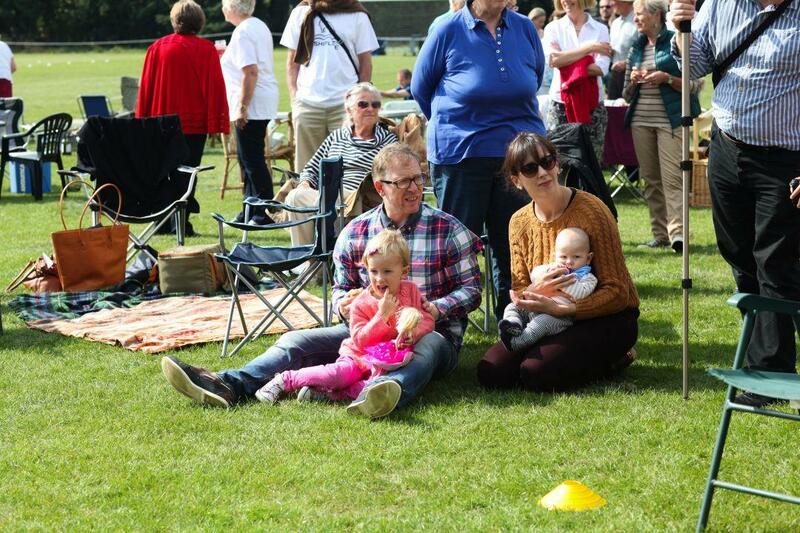 This is a fun annual event that brings together all ages of the community. 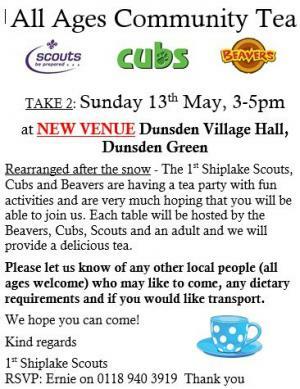 Our young Scouting members entertain and serve afternoon tea to all that attend. This year there were two poetry readings by the Beavers & Cubs the theme being Daffodils. Also there was an award ceremony where badges earned recently were given out to the Beavers, Cubs & Scouts. Games played were a beetle drive and a quiz. Afternoon tea consisted of fresh sandwiches, crisps, fancy cakes & drinks. There were prizes for the youngest (Orla 3 years old) and oldest guest (Cissy 94 years young). 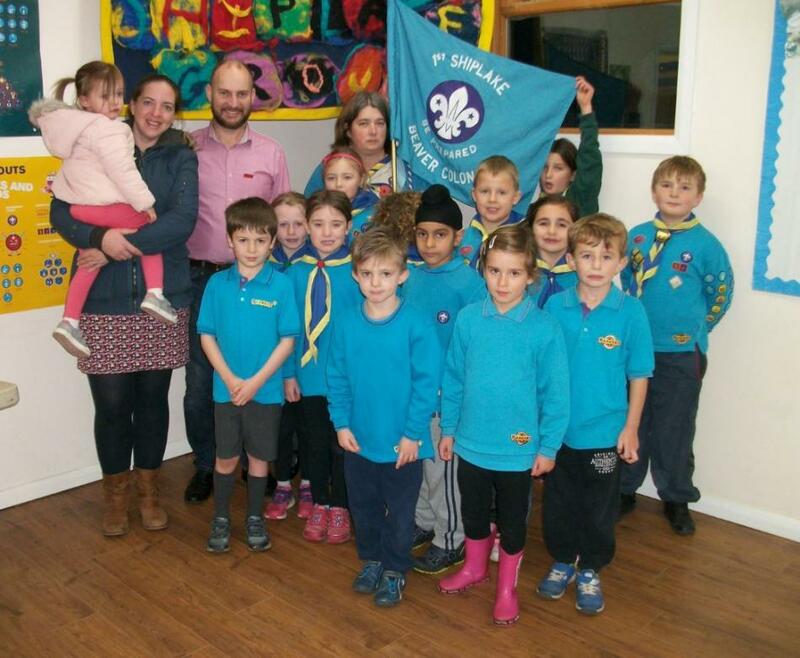 The First Shiplake Scouts have their premises located in Upper Shiplake just on the outskirts of Binfield Heath. They have been campaigning for donations to enable them to repair the roof of their hut, which is leaking badly. They have also identified a number of other needs that would enable them to make their lives more comfortable especially when meeting during the cold winter months. The old wall heaters had failed and they desperately needed replacing together with some automatic taps for the cloakroom facilities to prevent water wastage and flooding. 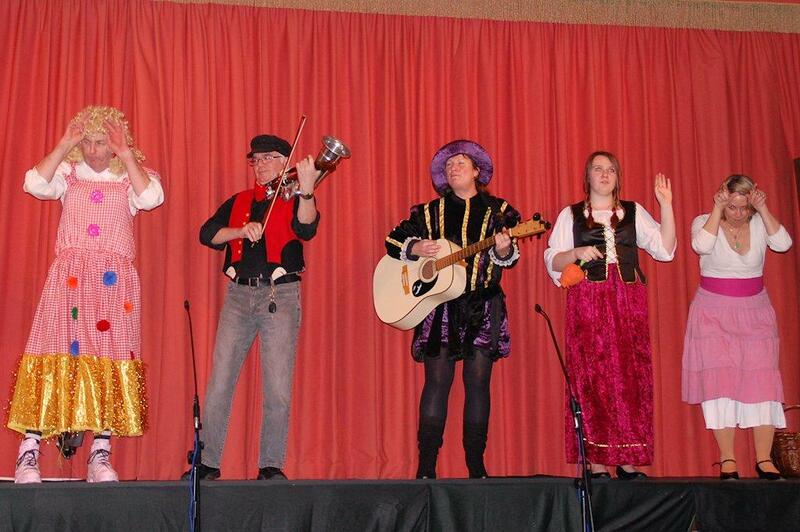 With all their efforts going into fund raising for the roof they felt unable to proceed with the extras. 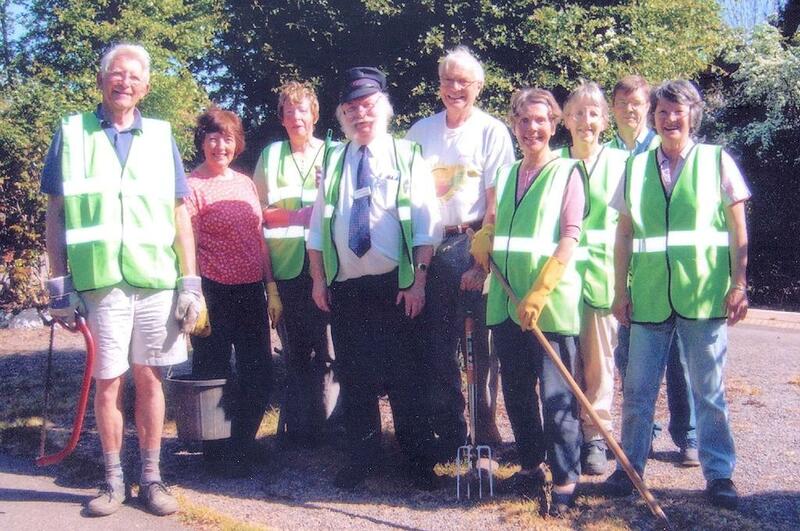 It was at this point that Henley Lions got involved and secured the necessary funds for the heaters and taps. A cheque for £230 was donated to the First Shiplake Scouts on Monday evening 27th February. 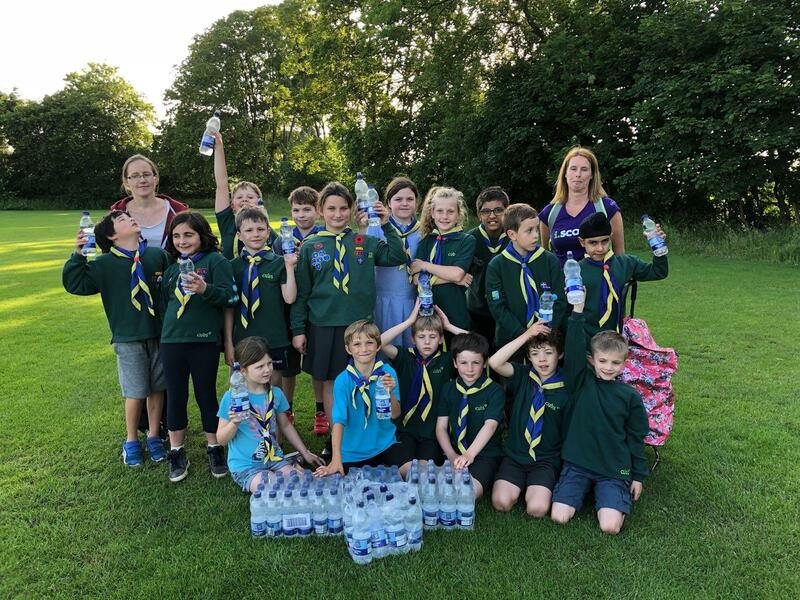 "The 1st Shiplake Scouts Group would like to thank The Lions Club of Henley-on-Thames for their very kind donations of two wall heaters and a pair of non-concussive taps for the toilets." 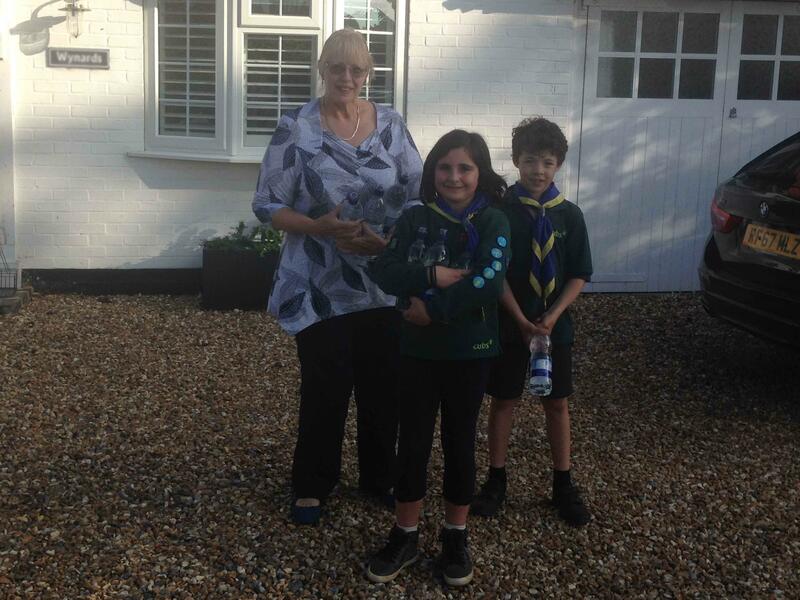 The 1st Shiplake Scout Group would like to thank the Henley Round Table for their very generous donation of £1371:00 towards the Scout Hut roof covering replacement. 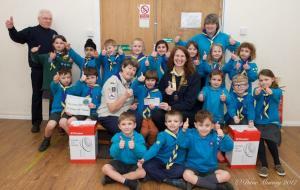 Beavers, Cubs & Scouts helped Santa and his elves with the collection around Shiplake. 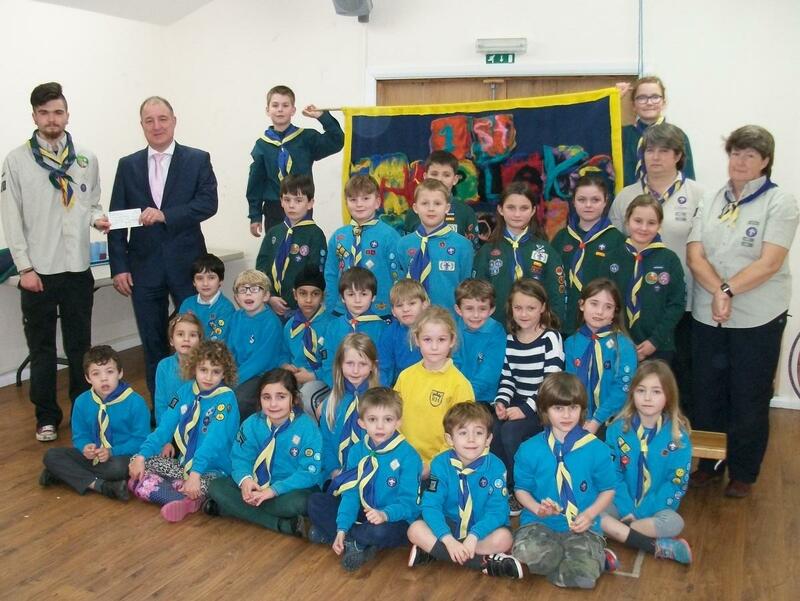 In the group photograph, on the left is Trevor Michel, Chairman of the Henley Round Table, presenting the cheque to Andrew Huyton, Cub Akela. 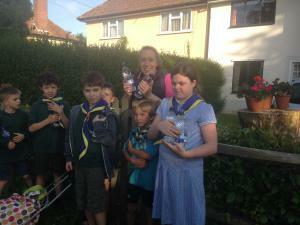 Far right is Debs Boughey, Group Scout Leader for Shiplake, on her right is Kaeti Martin, Beaver Leader. Scouts Matthew & Daisy are holding the flag. Scouts, Cubs and Beavers below. The Baskerville, Lower Shiplake, held a Children’s Halloween Garden Party again this year - this time to raise money to help the 1st Shiplake Scout Group replace the roof covering on the scout hut. 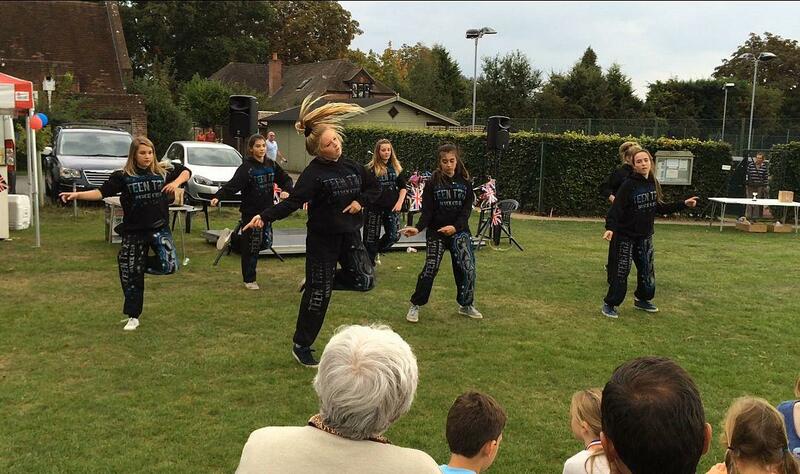 A fantastic £465 was raised. 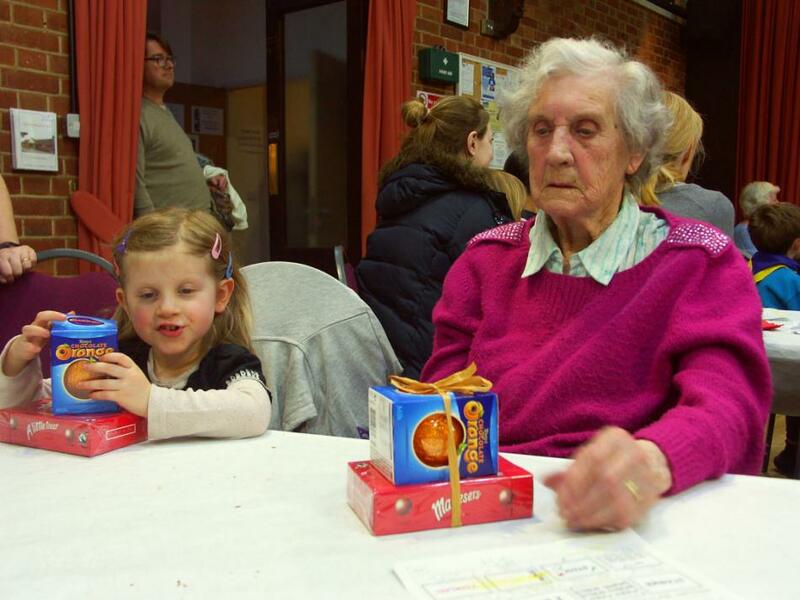 Fun, Games and Fancy Dress competition were enjoyed by all. 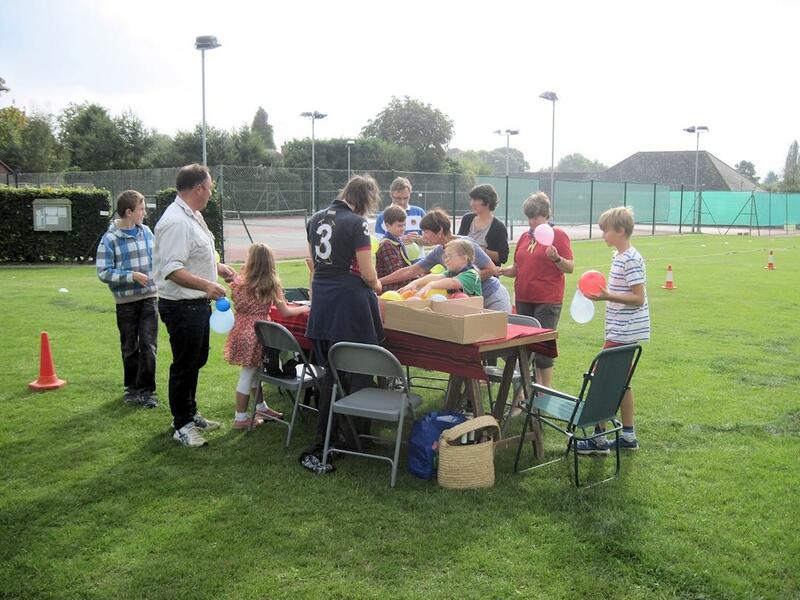 A free burger was supplied with every ticket, expertly cooked on the BBQ by Keith the "Shiplake Butcher". Many thanks to Kate and Kevin Hannah and their staff. 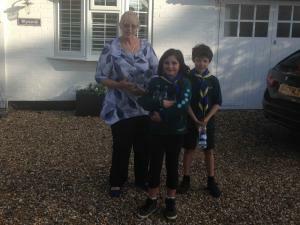 The photograph shows Kate & Kevin with their son Charlie who has just joined the Beavers, and Beaver Leader Kaeti Martin. The excitement is mounting ready for the 1st Shiplake Scouts Group Spook Walk on Thursday 3rd November from 6:00pm - 8:00pm. Not only is it a fantastic evening - full of spooky family fun! 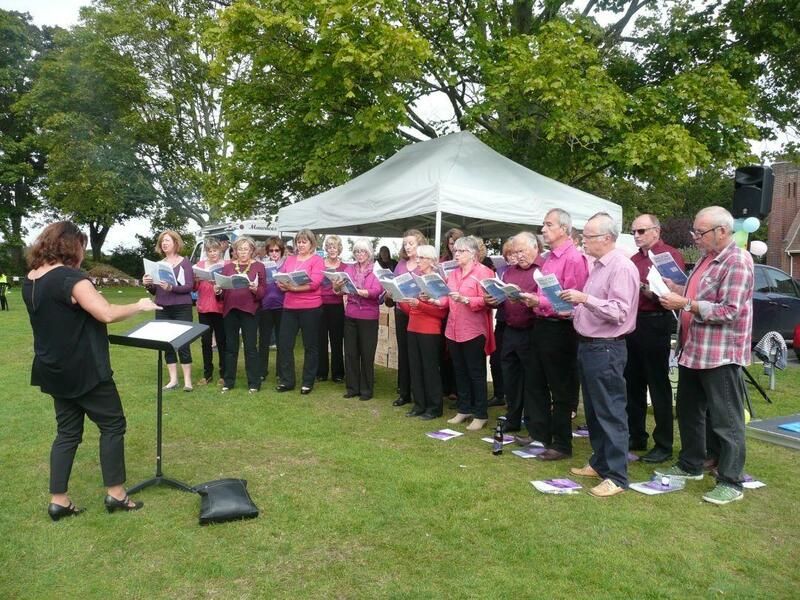 - it is one of our biggest fundraisers. I am sure you will have seen the posters. King George V granted a Royal Charter of incorporation to the Boy Scout Association in 1912, the year in which the 1st Shiplake Troop was formed. District sports were started in 1948. 1st Henley first won these. In 1952, when there were ten Groups in the district (1st Alexandria of the Royal Alexandria School, Bishopswood; 1st Checkendon; 1st Goring Heath; 1st Goring-on-Thames; 1st Harpsden; 1st Henley-on-Thames; 1 st Peppard Common; 1st Rotherfield Greys; 1st Shiplake and 1st Stoke Row) the result of the sports was Henley 16 points, Goring Heath 11 points, and Goring and Shiplake 6 points each. 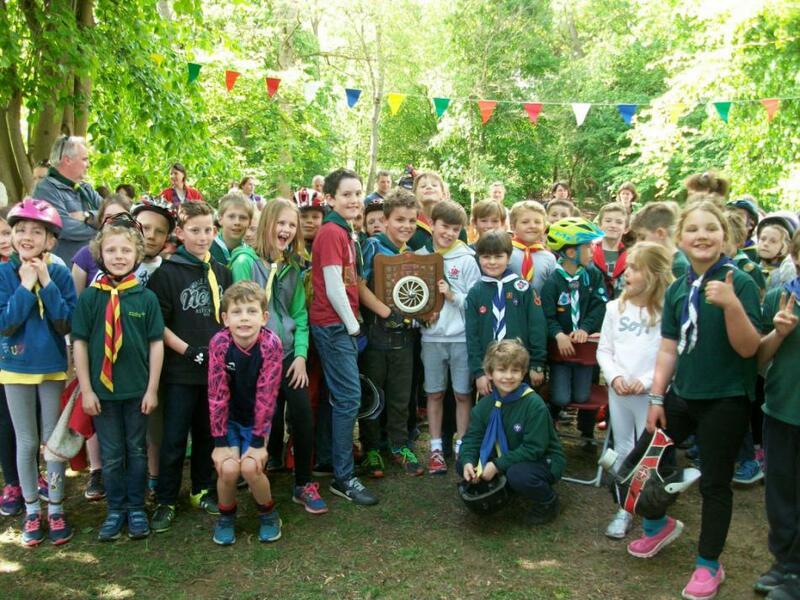 At the fourth camp, in 1957 at Goring Heath, Jim Wells, the Scoutmaster of 1st Shiplake, presented a new trophy for a competitive wide game. The Beaver patrol of 1st Henley won the Wells mallet at that camp. Were you ever a Scout? Have you got any photos? Shiplake Scouts was one of the first groups to be formed in England and the condition of the Scout Hut roof is testament to how many youngsters have enjoyed being part of the Movement. We now need £2,500 to repair the roof, and Andrew Huyton (Cub Leader) is kicking off a fund-rasing campaign this Wednesday (31st August). The Scout Hut will be open from 6pm to show the work and activities of the current Beavers, Cubs and Scouts and Andrew would like some old photos of past camps and activities. If you have any photos of yourself or your children taking part in Scouting activities please could you bring them along on Wednesday. Light refreshments will be available and you will be able to reminisce about those wonderful wet camps and dodgy cooking. 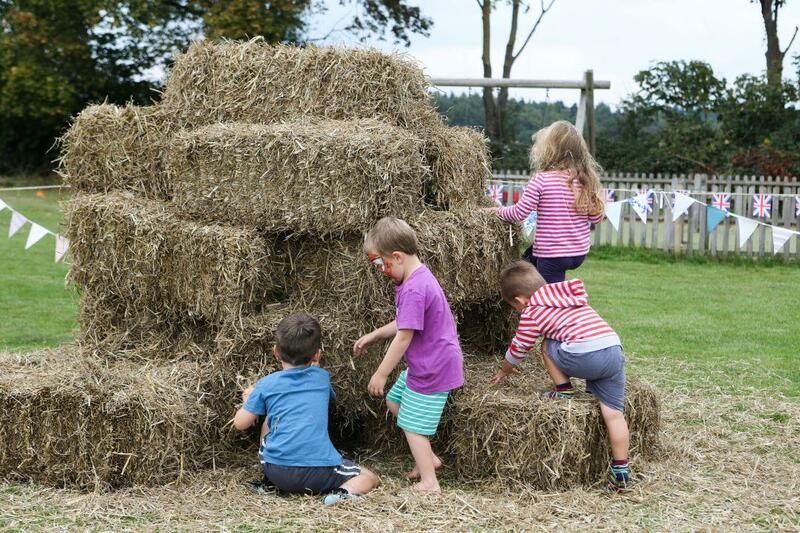 If you feel it is important for children to esperience the great outdoors and would like to support the fund-raiser then you might consider giving a donation. For more details please contact Andrew on 07881 276692.